Aside from its namesake spots, the polka-dot tree frog is just about the plainest looking frog you’ve ever seen—green. That is, until you shut off your flashlight and hit it with some ultraviolet rays. Fluorescence, a glow-in-the-mostly-dark property, is mainly confined to certain species of fish, turtles and parrots. No one’s ever reported fluorescence in frogs, until some Argentinian researchers decided hey, let’s shine some dang frogs with some ultraviolet light and see what happens. Those researchers don’t know why the polka-dot tree frog is fluorescent yet, but their discovery could lead to a whole new way of studying amphibians. 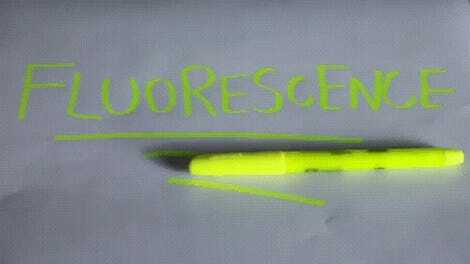 But first, what exactly is fluorescence? Fluorescence occurs when something gets hit with light, which it re-emits as a different kind of light. In this case, the something is chemicals in the frogs’ skin, the light that triggers fluorescence is a type our eyes can’t see, ultraviolet, and the light the frog’s skin re-emits is visible. The glow only occurs so long as the ultraviolet light source stays on. Researchers had previously spotted a pigment called biliverdin in the South American polka-dot tree frog’s tissues that gives insects a faint red fluorescent glow, according to a Nature report, so they decided to shine the frogs with some UV light. Rather than a faint red, the frog shined in bright blues and greens—and biliverdin had nothing to do with it. Instead, a set of chemicals they named hyloin-G1, hyloin-L1 and hyloin-L2 that originated from the frog’s lymph fluids glowed from beneath the little dudes’ translucent skin, according to the paper published this week in the Proceedings of the National Academies of Sciences. Those chemicals make the frogs shine really brightly—at least 18 percent as bright as the total light at night under a full moon. Land is already pretty bright and colorful, and the researchers cite a past study that says maybe fluorescence is irrelevant above the water. 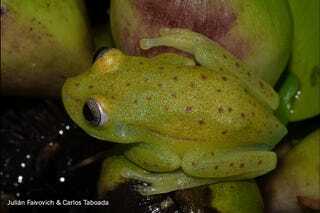 However, the retinas similar species of frogs use for night vision seem especially good at viewing the specific colors of light the polka-dot tree frogs fluoresce. That means very little, because it’s just a correlation and isn’t even between frogs of the same species. However, there are lots of interesting hints that fluorescence might be a tool these frogs use to recognize each other. Now, the researchers just need to observe lots more frogs and run more experiments. In the meantime, we have these cute little glow-in-the-dark frogs to look at.